Kwong Kwok Wai is a writer, painter and former journalist. Like many people of Hong Kong born before 1997, he describes his life as segmented into two periods: the colonial rule and Chinese sovereignty. Through fictions and paintings alike, he focuses on reminiscing this critical period of history while upholding human dignity. With three novels and one short stories collection published in the past 20 years, all written during after hours, he won numerous awards in the Chinese-speaking region. Narrative structure and point of view are Kwong’s prime concerns in fiction writing. He starts working on his fourth novel with special attention to develop experimental narrative techniques, seeking to uncover different layers of emotions, review layers of facts and unpack layers of history. This story is about power, mobilization of public influence, and dormination to write history for the time. He also engages in oil painting. In the ‘Vine Series’, the symbol of this slender plant is employed to express ideas and feelings about the Chinese infiltration into Hong Kong. 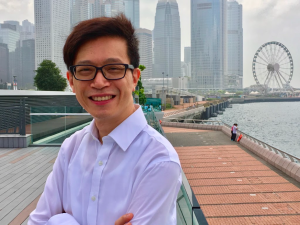 During his 30-year career from a front-line journalist to an executive producer of news, Kwong covered all the important political events in Hong Kong, such as 1997 Handover and 2014 Umbrella Movement. Recently he decided to start a second career for the pursuit of arts. As a journalist witnessing and reporting the ups and downs of Hong Kong for decades, he often finds arts a freer and more genuine form of expression of the truth.